26977 McLaughlin Blvd, Bonita Springs, FL.| MLS# 219027600 | Bonita Springs, Estero, Naples, Fort Myers Beach FL Real Estate | Marie Pimm PA Realtor. Representing U.S. and International Buyers and Sellers in the purchase and sale of investment or personal property. Marie is a skilled 1031 Exchange Realtor. 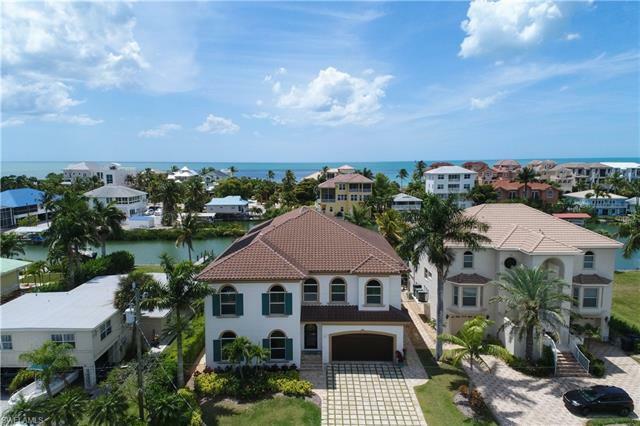 Recently constructed Bonita Beach gulf access luxury home. Sprawling residence that offers rare western exposure and is one of the closest Carolands properties to the beach. Built in 2014 this concrete and impact glass property offers 4 bed + den layout and 5 total baths. Rare one living level layout. This home offers a generous horizontal feel with high ceilings throughout. Tasteful coastal selections and finishes top to bottom. The kitchen offers custom cabinetry with extensive glass fronts, dual islands with bar seating for 7 and butlers pantry that includes large prep area, sink, and wine refrigeration . The master suite is also large with a luxurious bath featuring his and her vanities, rain head shower, and large soaking tub. Private elevator, home audio, and expansive 4 car garage are additional features. The outdoor space is also built for entertaining with an oversize screened lanai off of the 90 degree living sliders. Full outdoor stair to the custom pool and spa. The pool area offers more covered entertaining space, guest suite, pool bath, and lower kitchen area. Ideal boating location with lift and rare covered dock. This luxury home checks all the boxes. Call today!